It seems to be a slack time for new displays, but I have seen a few things in the several weeks since my last display post and thought I'd go ahead and share them rather than wait for more spring things to show up (I know it's nowhere near spring in real life, but retail has its own calendar). 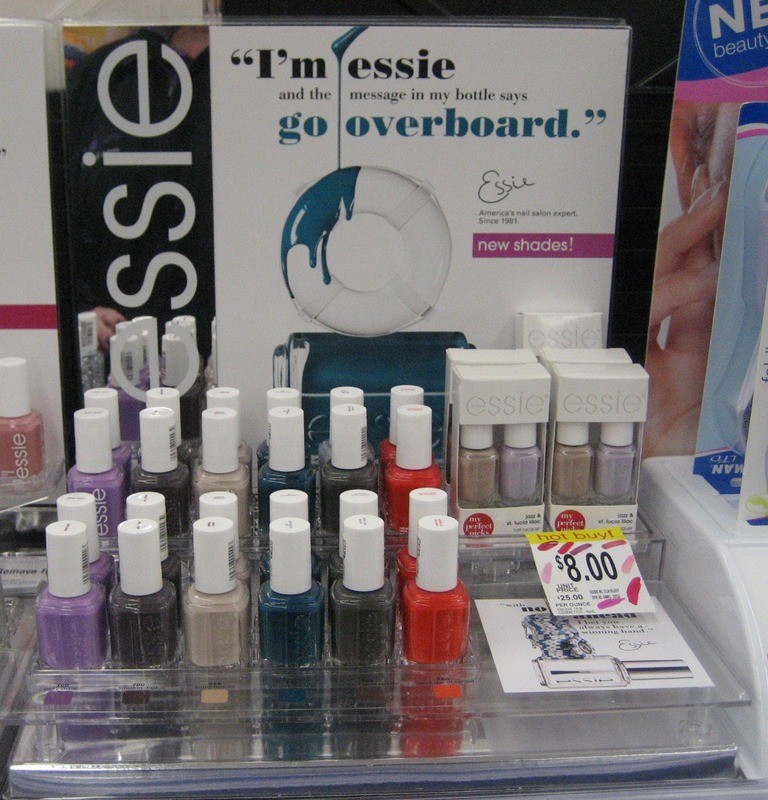 First up, here's a standalone display with the Go Overboard collection from Essie which I spotted at Walgreens; I'd previously only seen those polishes on an end at Target which combined them with Luxeffects. 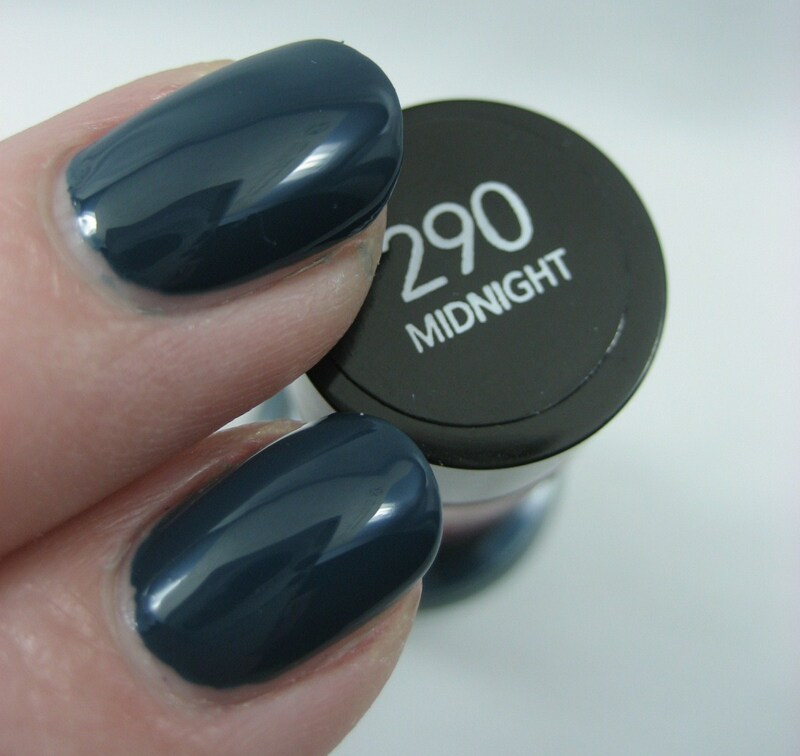 This has the three Go Overboard shades mixed in with the re-promotes from previous collections which were also on that end at Target. Left to right: Play Date (new), Smokin' Hot (reissue), Sand Tropez (reissue), Go Overboard (new), Armed and Ready (new), Meet Me at Sunset (reissue). This also had two-packs of minis in colors other than the ones in the full size bottles, which seemed sort of random. I haven't bought any of the new ones yet. I probably will get Armed and Ready soon, but I'm not sure about the other two; they are Karen colors, but I'm not convinced they're different enough from the ones I already own. You may recall the heartbreak of the empty LA Girl glitter display from the last round—I was more fortunate at at different Rite Aid and found a mostly full one. In an impressive display of self control, I only grabbed three of these. So far, I suppose I should add. 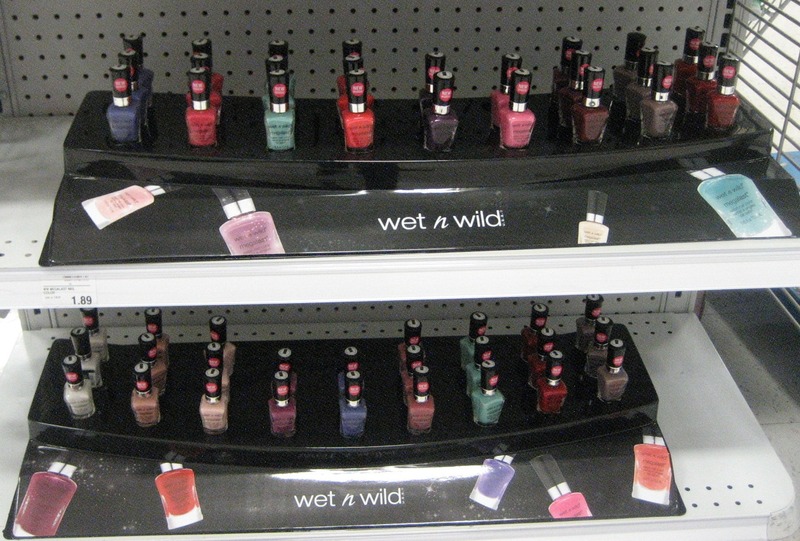 Rite Aid also had a Wet 'n' Wild MegaLast relaunch display which was different than the ones I'd seen at Meijer. I am not sure what they mean by the "30% more formula" blurb on here—the bottles hold 30% more, maybe? Colors here, left to right: Sugar Coat, Undercover, Wet Cement, I Need a Refresh-Mint, On a Trip,Through the Grapevine, Candy-licious, I Red a Good Book, and Disturbia. 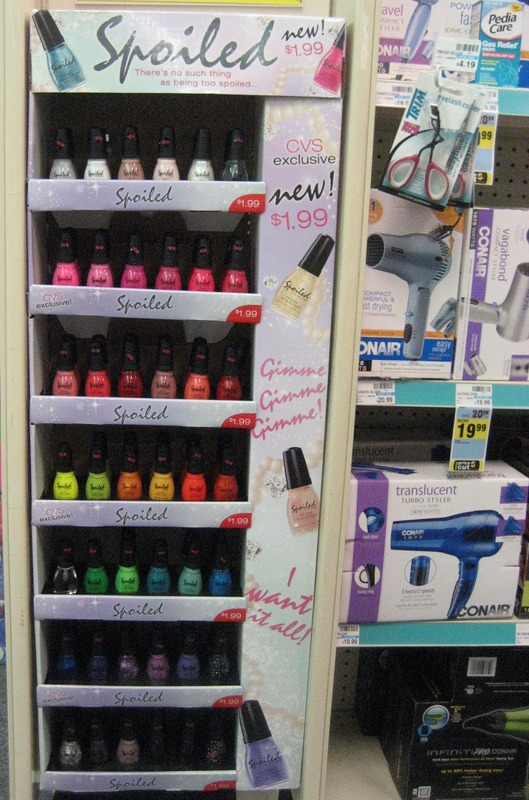 At CVS, I saw what I think is the permanent display for the new Spoiled line; it was sturdier than the cardboard one which was my first exposure to the brand and it had more slots. It did not have very many polishes in it; I expect they were in the process of stocking it when I happened by, so I'll have to check back soon. 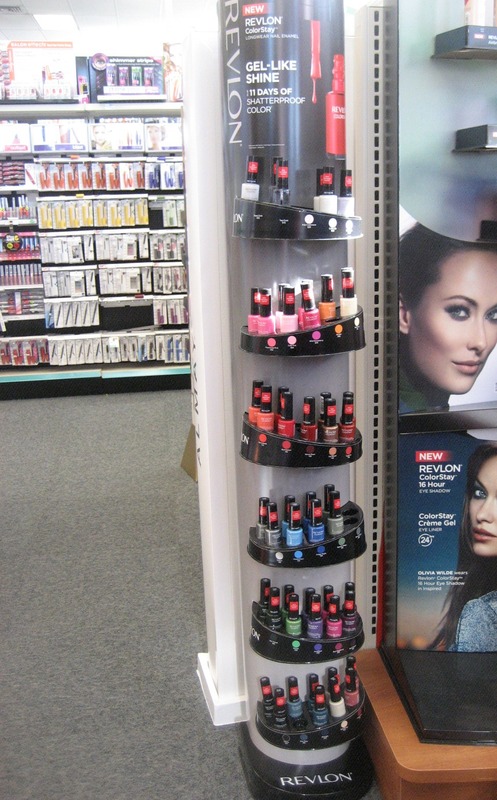 A different CVS (there are about a half dozen I regularly check since they have conveniently located them all along my route to and from work) had a Revlon ColorStay configuration I hadn't seen before: a tall tower with curved shelves. 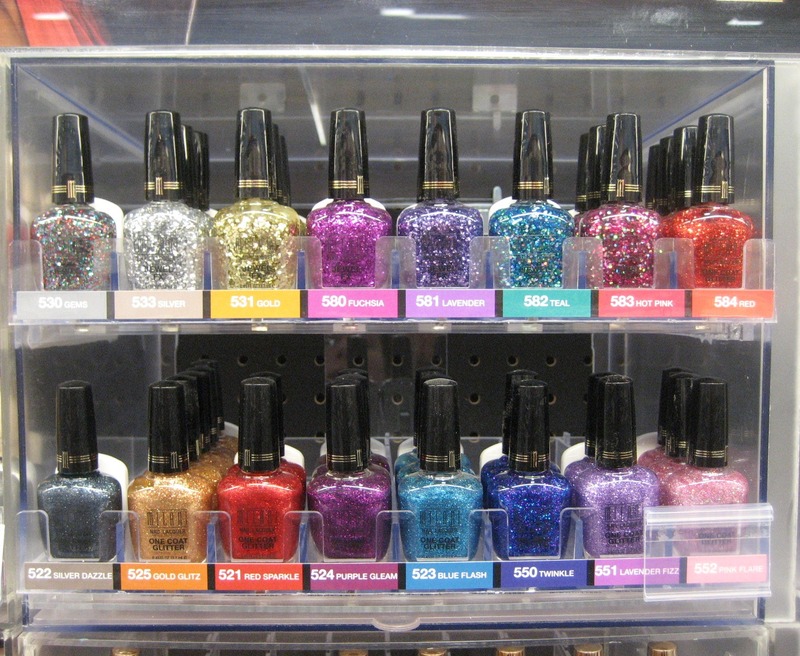 Ulta had the OPI Nicki Minaj collection. The only thing I know about Nicki Minaj is what I learned from part of a special on MTV that I happened across when channel surfing one night, in which she left a photo shoot because they didn't have a lavish enough spread of snacks and didn't want it to be okay for people to treat her that way. So maybe she's a diva, I don't know. 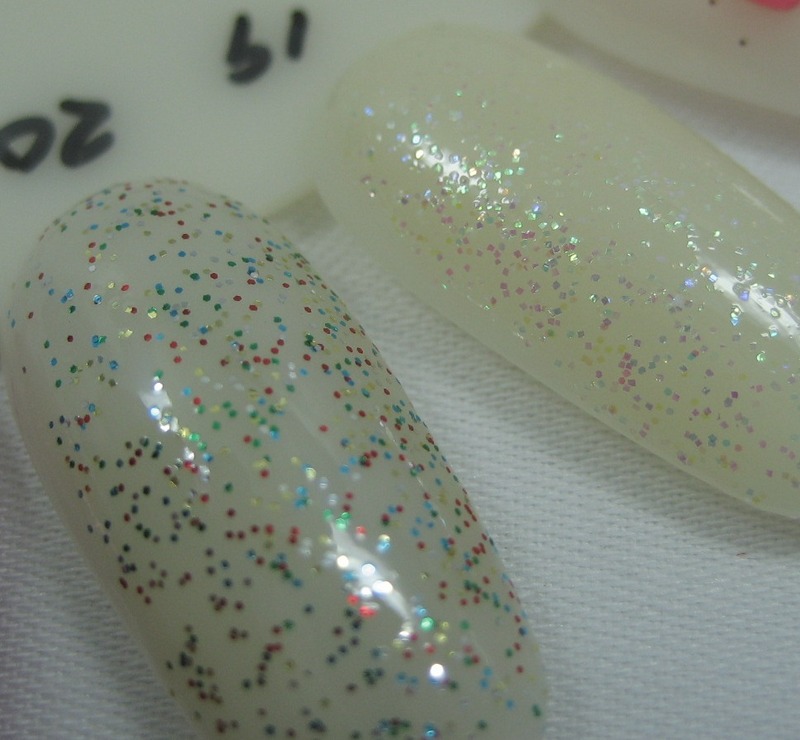 I do know I want some of these polishes. I am going to try and resist the cremes: Pink Friday (if that had been a holo, oh yes, it would be mine), Did It On 'Em (lime), or Fly (turquoise). 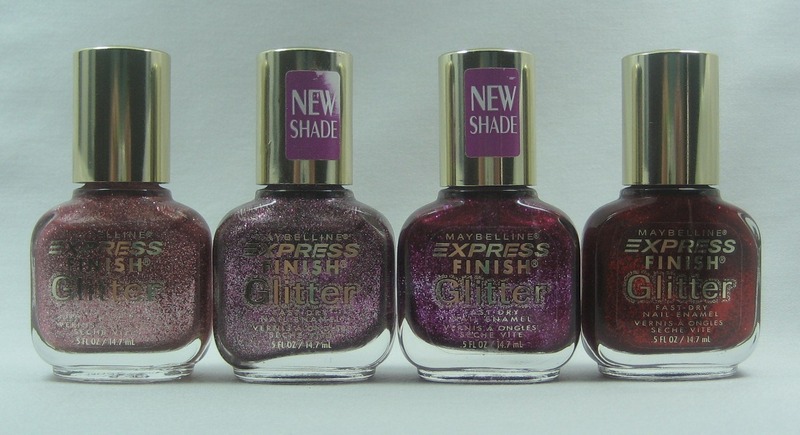 I have definite plans to get the others as soon as I find them at less than regular retail: Metallic 4 Life (charcoal with silver glitter), Save Me (silver/multi glitter), and Super Bass Shatter (purple-y wine crack). 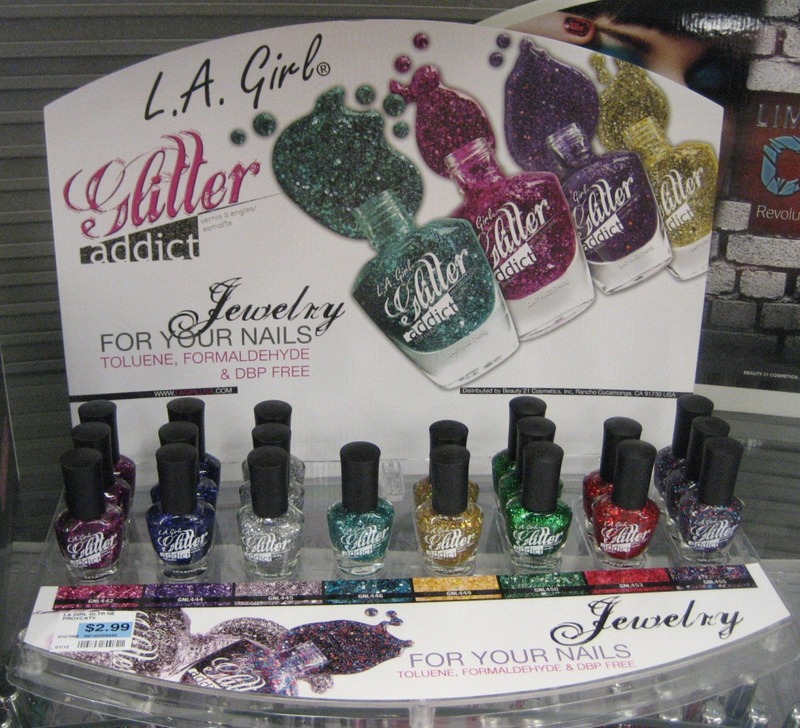 The Zoya Feel collection was also at Ulta. Six cremes here: Kristen (greyed blue), Carey (blued grey), Megan (lilac-y grey), Kendall (greyed rose), Kennedy (muted pink), and Avery (muted peach). 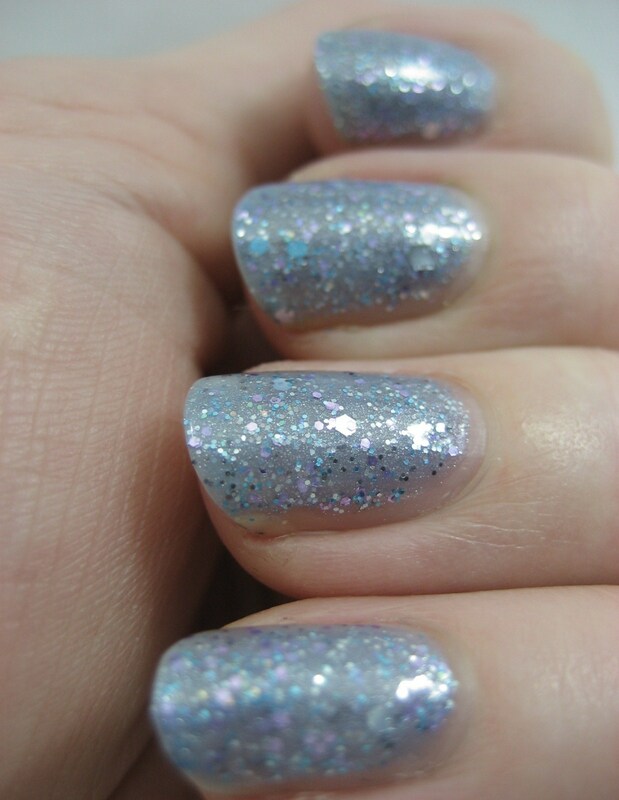 I already got Kristen and Carey direct from Zoya (cremes, I know, but so pretty, and at least I didn't get all six). 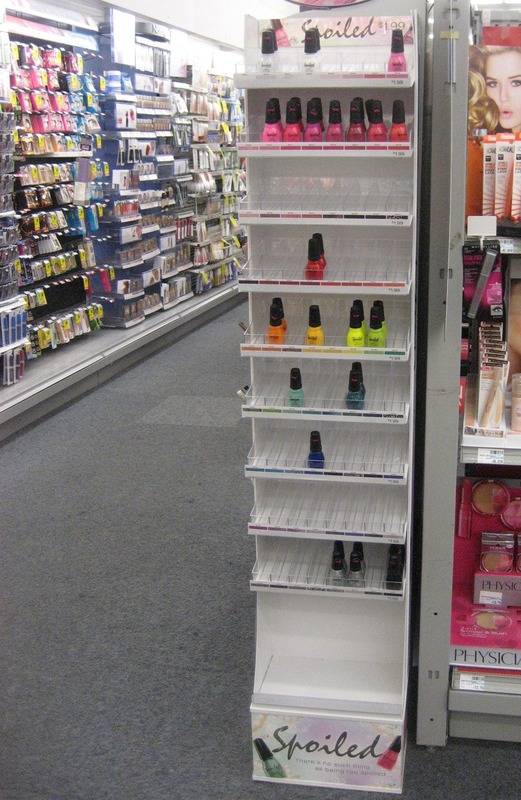 Lastly, Meijer had re-done their Milani core display and appeared to have all the new glitters. The confusing thing was the slot for the new red Jewel FX was occupied by what looked like a new version of the One Coat Glitter Red Sparkle. Version 2 is red with gold accents, rather than all red like the original Red Sparkle. So I still haven't seen the new Red Jewel FX in person; I know it's out there, so I'll have to keep looking. Top row, left to right: Gems, Silver, Gold, Fuchsia (new), Lavender (new), Teal (new), Hot Pink (new), Red Sparkle v. 2(should be new Jewel FX but is not). Bottom row: Silver Dazzle, Gold Glitz, Red Sparkle, Purple Gleam, Blue Flash, Twinkle (new), Lavender Fizz (new), Pink Flare (new). 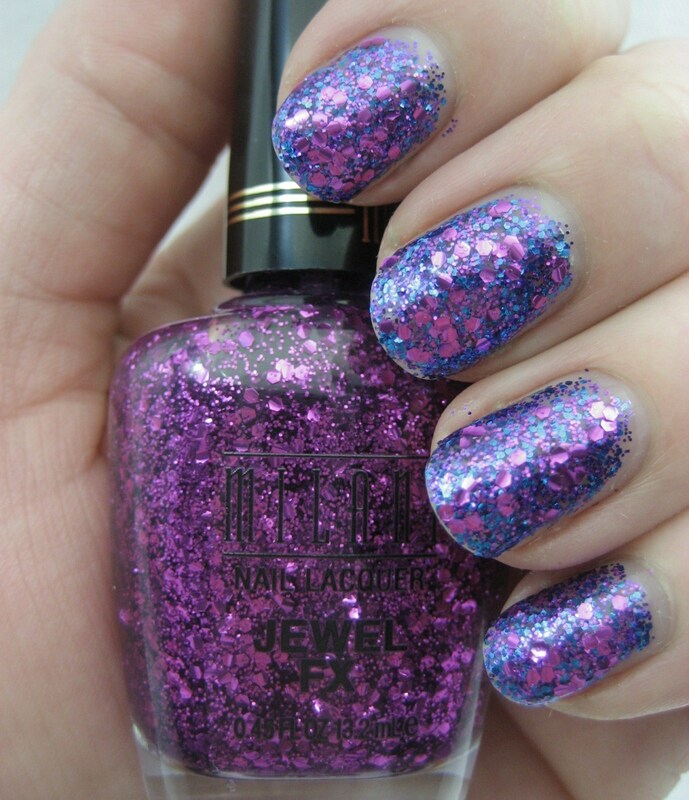 Besides the Red Jewel FX, I can't think of anything I'm waiting to see right now besides OPI Holland, but I'm sure things will pop up and surprise me. That's the fun of it! 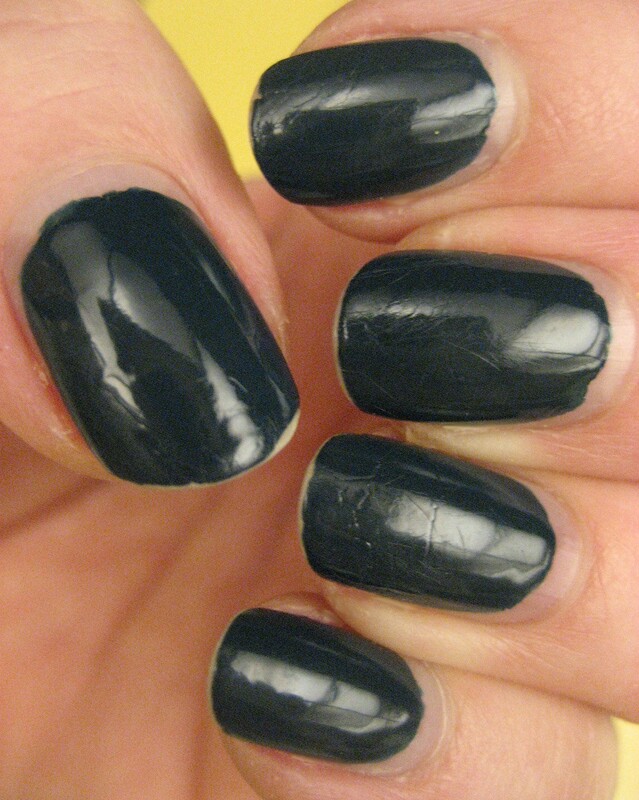 If you're a regular reader, you might be thinking "what Sally Hansen strips did she wear this trip?" The answer is "none". 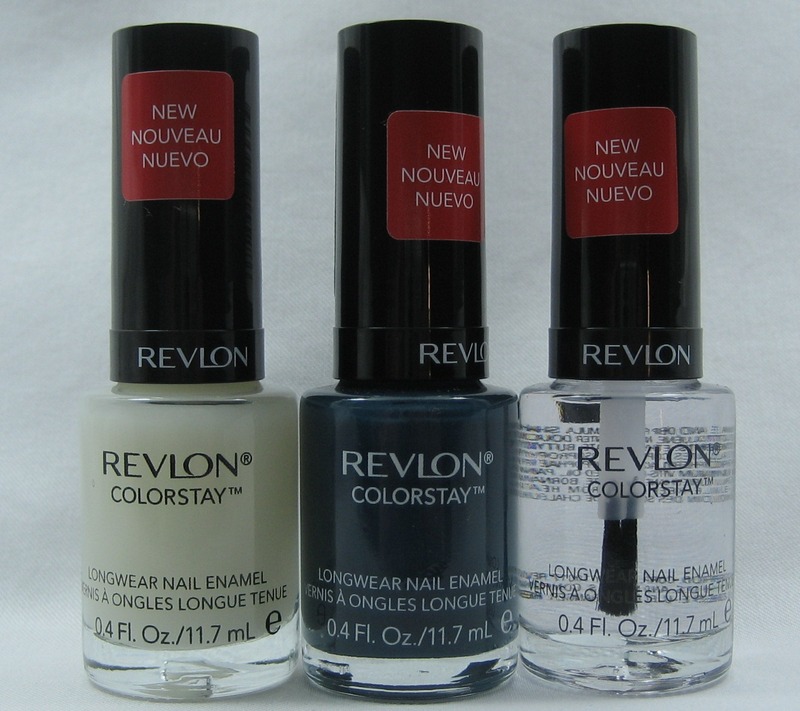 I did bring some along, fully intending to put them on as soon as I called an end to the wear test I was doing of one of the new Revlon ColorStay shades, Midnight, a deep teal-leaning blue creme. I usually have no qualms about mixing brands between base, color, and top coat, but in ColorStay's case, I went ahead and bought the base and top coats, since I remember the previous incarnation of the line when the color and top coat were only sold together, as a system. 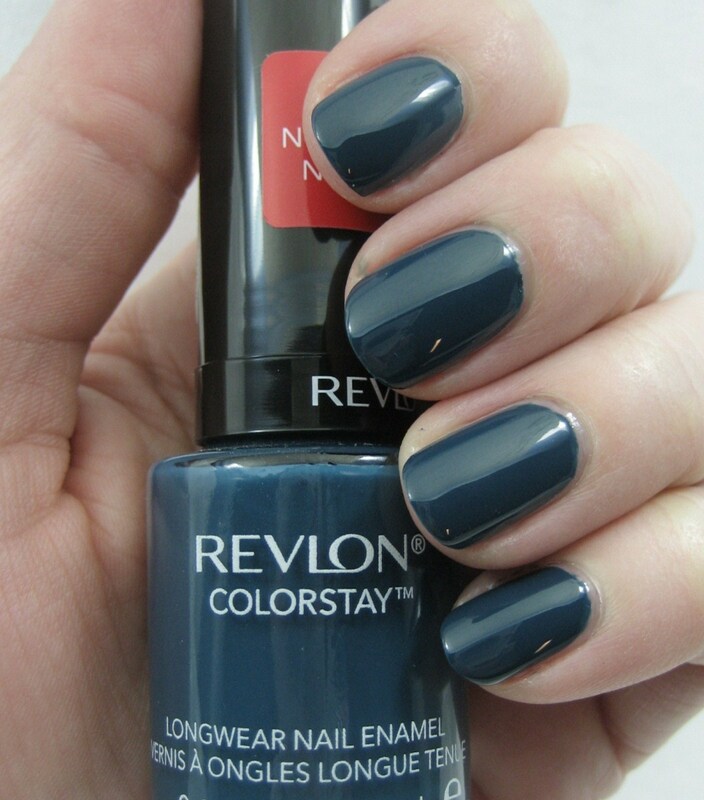 Still, I was curious to see if the matching base and top coats made a difference, so when I did my manicure a week before I left for my trip, I used the Revlon ones on most of my fingers, but my usual base and top coats on my ring fingers (all over a first layer of the Esmalte strengthener). I used two coats of Midnight. It dried a touch darker than the bottle color, but definitely still looked blue even in low lights which made me happy. It was plenty shiny with both the Revlon top coat and my usual Sally Hansen Insta Dri. The displays for this relaunch tout "Up To 11 Days of Shatterproof Color" (the fine print says that's when used with their base and top coats). I'd originally intended to take this off after about a week so I could put on strips for my trip, but when it came to that point, the polish still looked pretty good, so I left it on. Here it is six days in, showing some tip wear but no chips, and it's still fairly shiny. Six days later, so twelve days total, I did have a chip, and more tipwear, and some weird texture on some of the nails that is more likely the fault of cleaning products I was using at the ski condo than the polish (it happened on both Revlon and Sally Hansen top coated nails). I found the big gap at my base from nail growth more distracting than the wear, actually. 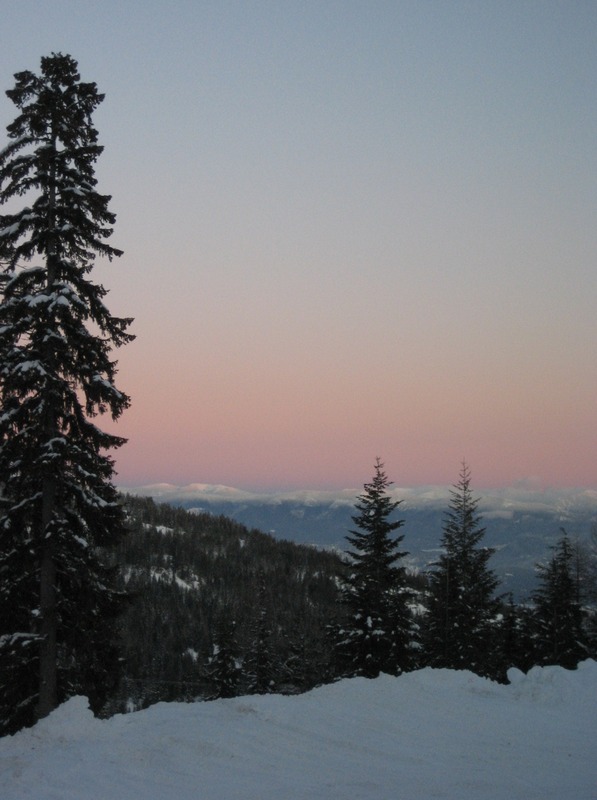 This shot also shows the dark face of this color; this shot was taken under the fluorescent light in the ski condo kitchen. Based on my experience, which is admittedly not a scientifically valid sample, I'd say the new ColorStay is long lasting and doesn't require the matching base and top coat to be that way. I did like the ColorStay top coat; it dried almost as quickly as the Sally Hansen Insta Dri and held up equally well. 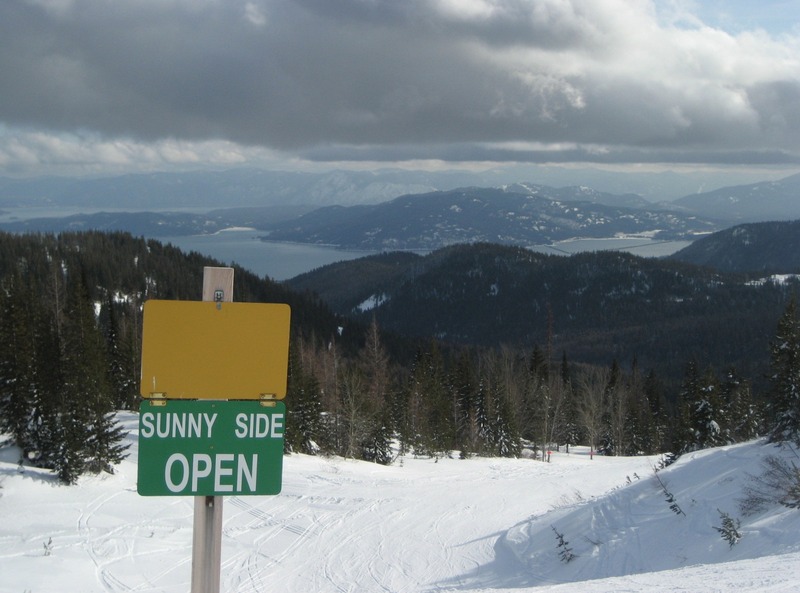 Since I didn't spend very much time online in the mountains, it's going to take me a bit to catch up with comments and emails and such. Please bear with me. 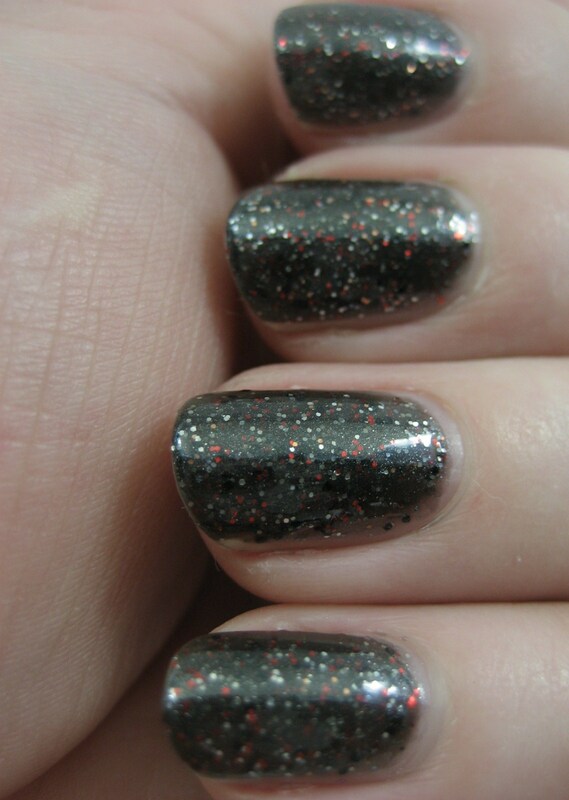 Today I've got the last of Monty Python trio from NerdLacquer. 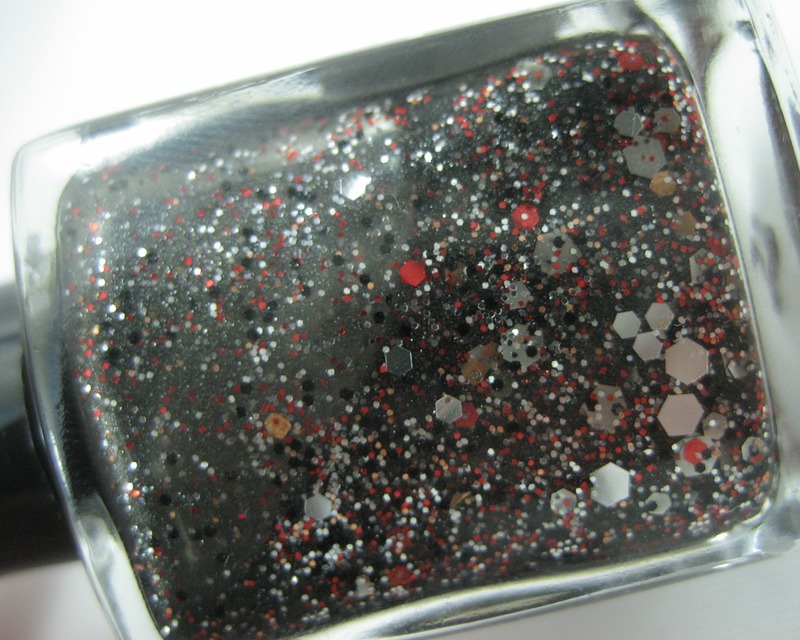 It's Just a Flesh Wound has "...a fierce black base with small and medium black, red, and copper hexagonal glitter, plus black and charcoal microglitter and big silver hex glitter. This color always triumphs, and will still look fearsome even if a passing king lops one of your arms off. Looks amazing as a top coat over black or red. 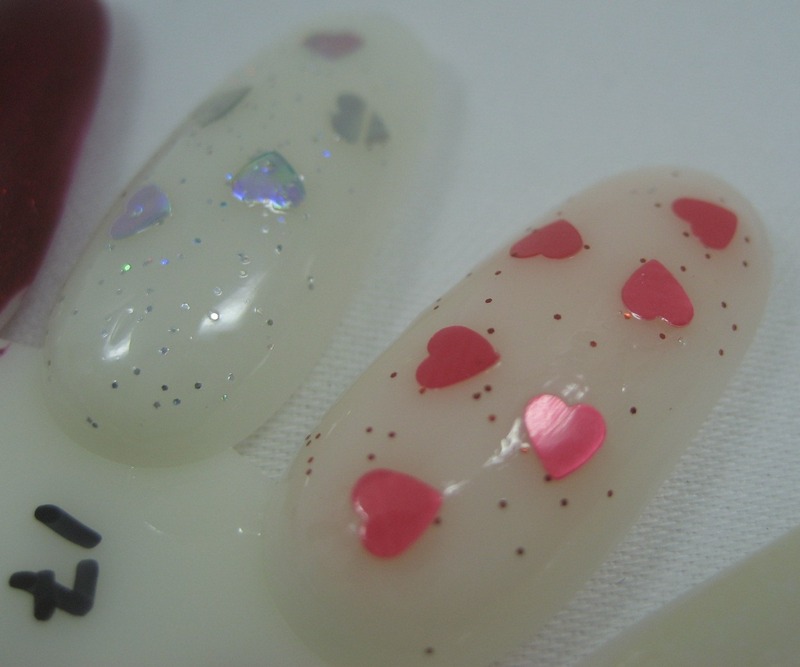 Also might challenge the other polishes in your collection to a duel; best to store it separately." Yep, that said black glitter, and I'm completely fine with it. 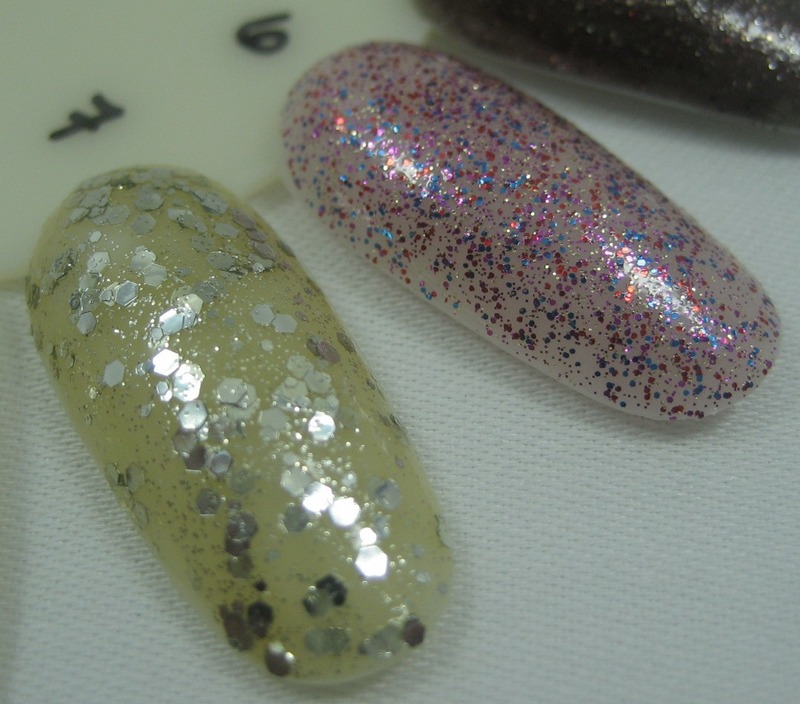 These swatches are three coats plus topcoat. I want to try this over silver as well as the red and black mentioned in the description from NerdLacquer. Maybe over a charcoal shimmer, too. 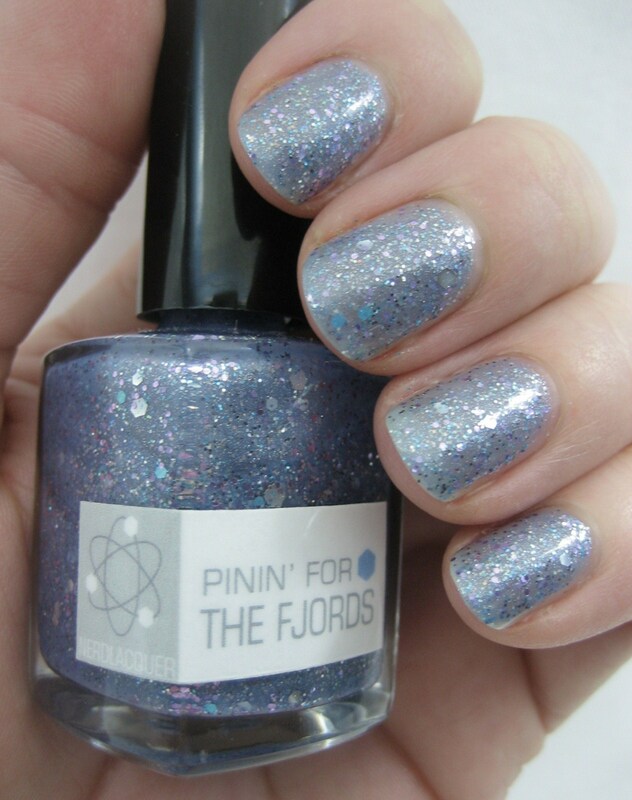 Here's the second in the trio of Monty Python polishes I bought from NerdLacquer, Pinin' for the Fjords. 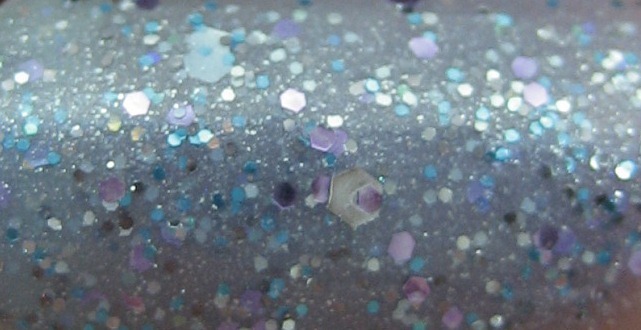 Again, I quote the shop description; this is a "...sparkling Norwegian blue with lavender and silver glitter, small and medium sky blue hexagonal glitter, charcoal micro glitter, and large silver hex glitter. Beautiful plumage, though not much of a conversationalist. 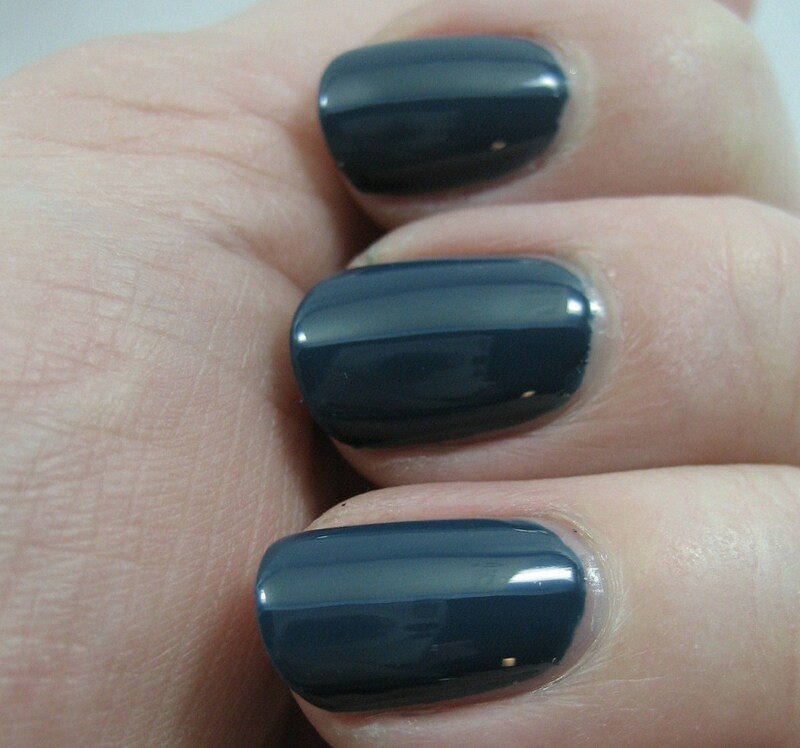 You might have to nail this shade to your fingers to keep it on." Hee—these sorts of descriptions tell me she's not just picking names out of a hat for these. 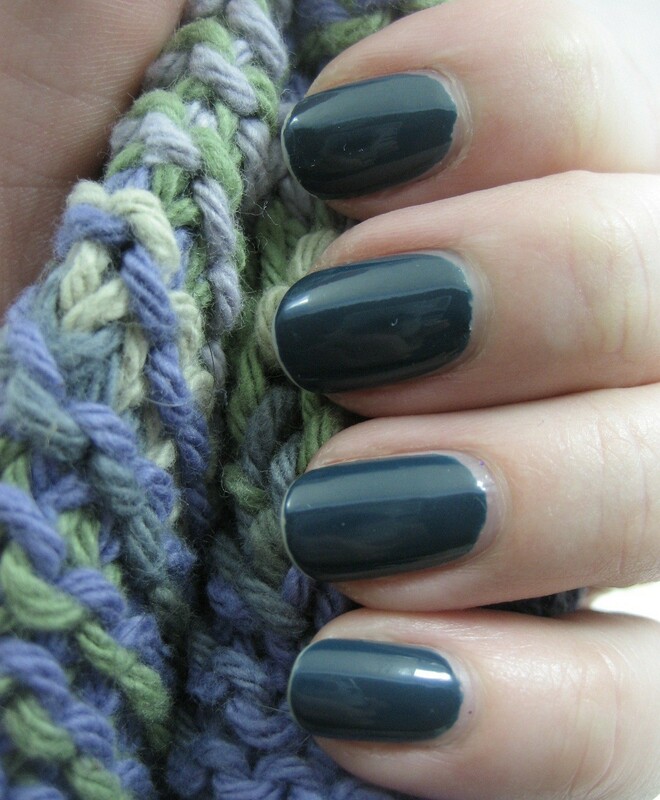 I swatched three coats plus top coat. I didn't get a chance to play with layering this one. I'm thinking it'll look good over silver and blue and probably lilac, too. A bit of throwback theme for this Nail Wheel Wednesday, since none of these polishes are in the brands' current lineups (though the Borghese are recent enough that you may come across them in stores that don't turn over their stock really quickly). 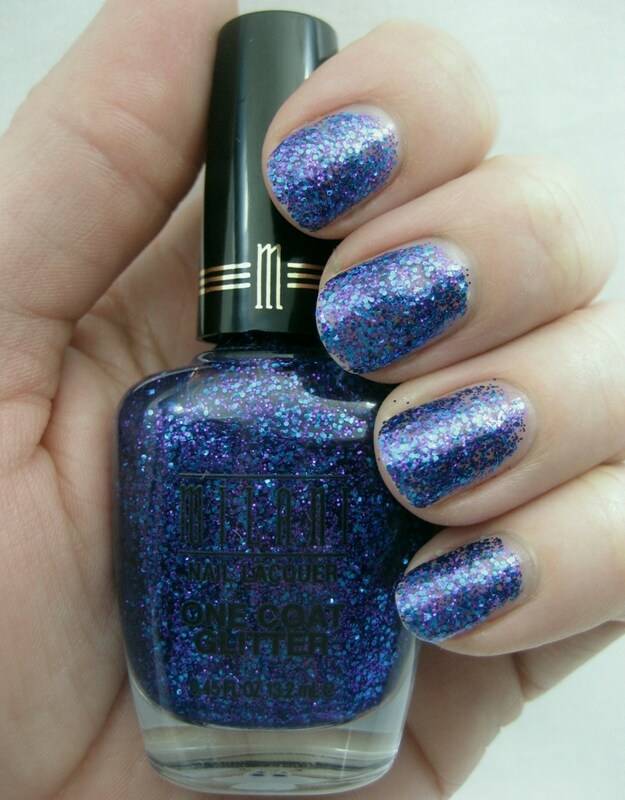 Looking at the swatches in my backlog to decide what to post for today, I saw a lot of my favorite thing, glitter, so decided since I'd already started with the Milani yesterday, this will be glitter week. 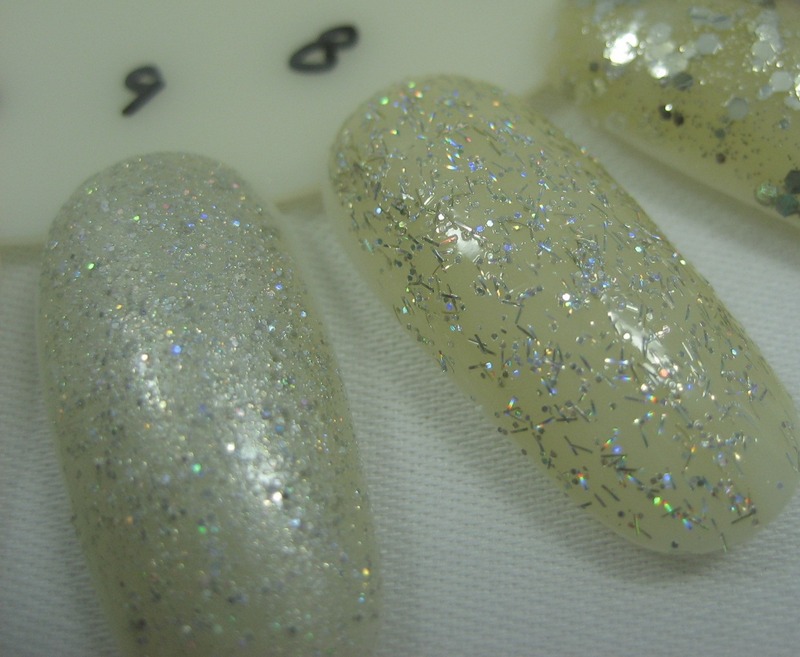 Those of you of a creme and shimmer persuasion may want to take a break until next week. I don't remember where I first heard aboug NerdLacquer. 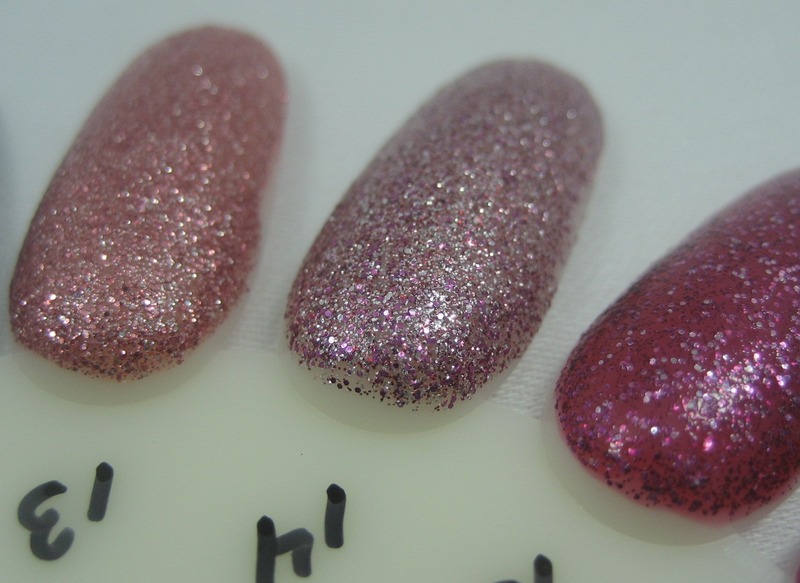 I do know that what turned me into a customer was finding out that she'd created a trio of custom-blended polishes inspired by Monty Python. I watched that show with my mom when I was an impressionable youth and later with my husband—we still quote lines from the show to each other from time to time. 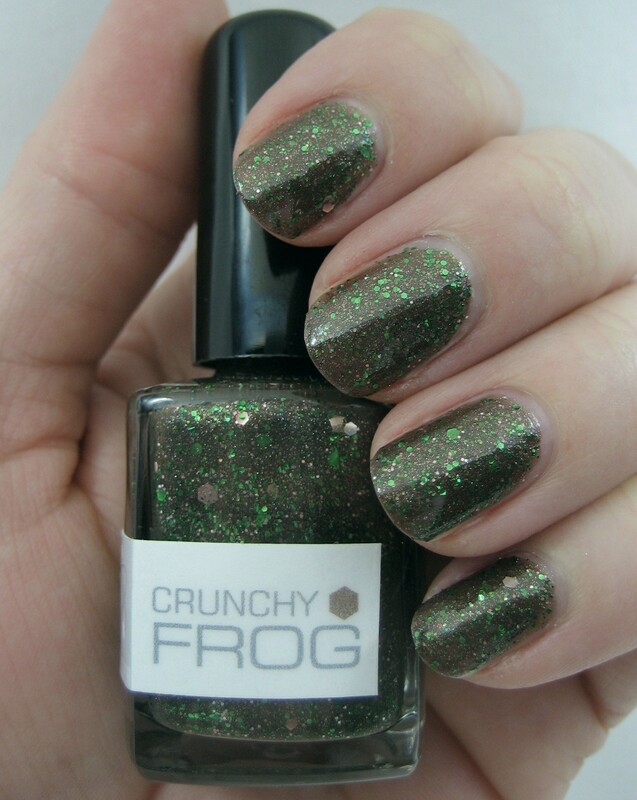 I just couldn't resist getting polishes with names like the one I have to share today, Crunchy Frog. 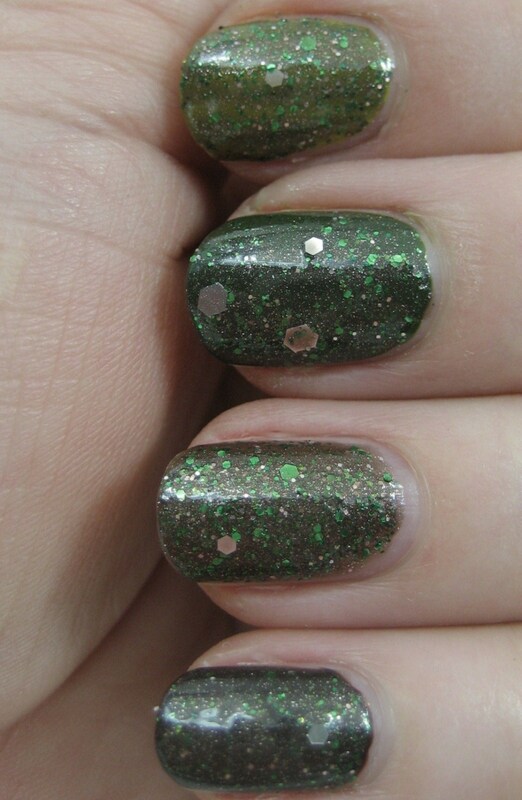 The NerdLacquer stores describes this as a "...revoltingly gorgeous milk chocolate shimmer base with emerald glitter, small and medium grass green hexagonal glitter, olive microglitter, and you might also notice some large chunks of silvery white. The bones, obviously. If we took the bones out it wouldn’t be crunchy, would it?" The bones—I love it! 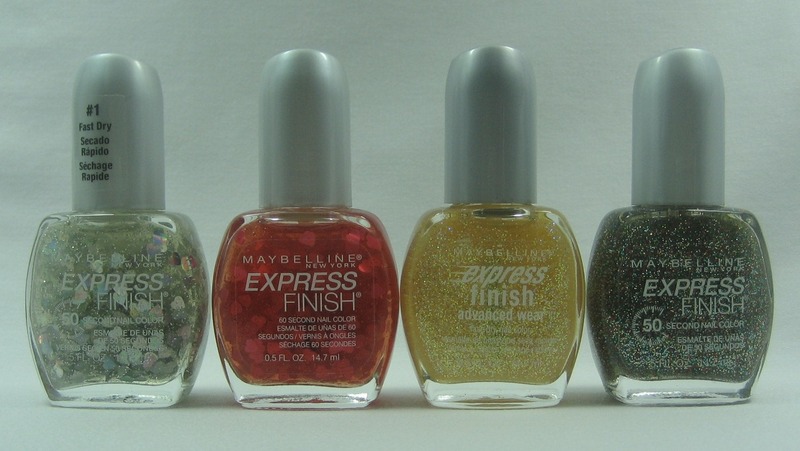 I used three coats of Crunchy Frog plus topcoat for these swatches. I couldn't resist seeing how this would look layered, so pulled some greens and a brown to try it with. Left to right below, it's Crunchy Frog, OPI Who the Shrek Are You, Zoya Shawn, and Essie Lady Godiva. Above, top to bottom: three coats of Who the Shrek Are You plus one of Crunchy Frog, two coats of Shawn plus one of Crunchy Frog, three coats of Crunchy Frog by itself, and two coats of Lady Godiva plus one of Crunchy Frog. I think Shrek might be a bit too light and bright to make a nice base for this; I liked it better over Shawn and Lady Godiva, with Shawn being my favorite (most frog-like, I suppose). Above, close up of Shawn plus Crunchy Frog in the foreground, with Shrek plus Frog twinkling in the background. I'll have the other two polishes in the Python trio later this week, and based on how much I like them, I expect more NerdLacquer will join my stash soon. I still haven't seen all of the new Milani glitters in person (I read somewhere that they're supposed to come out in February, though Milani has most of them up on their website now). I went ahead and tried out two of the ones I did find and buy: Twinkle, a blue/purple in the One Coat Glitter line, and Fuchsia, from Jewel FX. Here's Twinkle on its own. 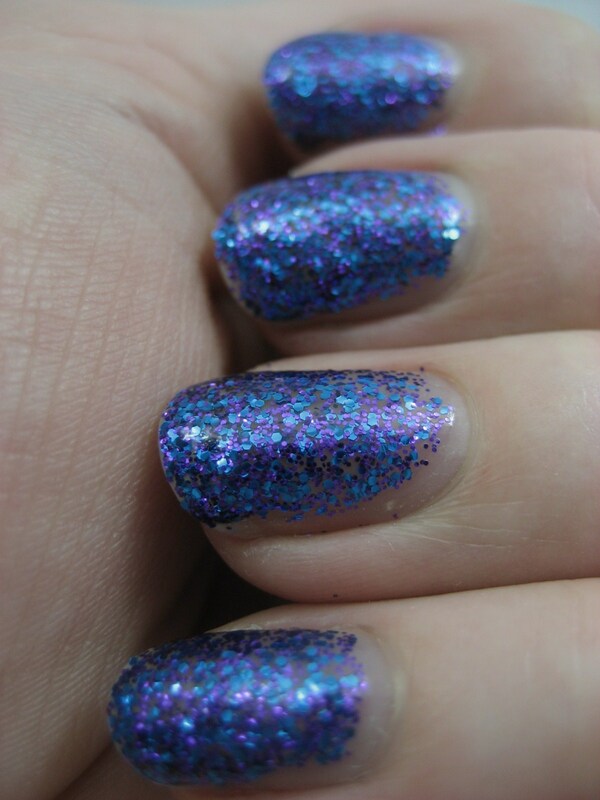 This is a bit different than the original release One Coat Glitters (like Purple Gleam); it's got both large and small glitters instead of just small ones, and I don't see any way it could cover in one coat. I used two and still see a fair bit of my nail showing through. 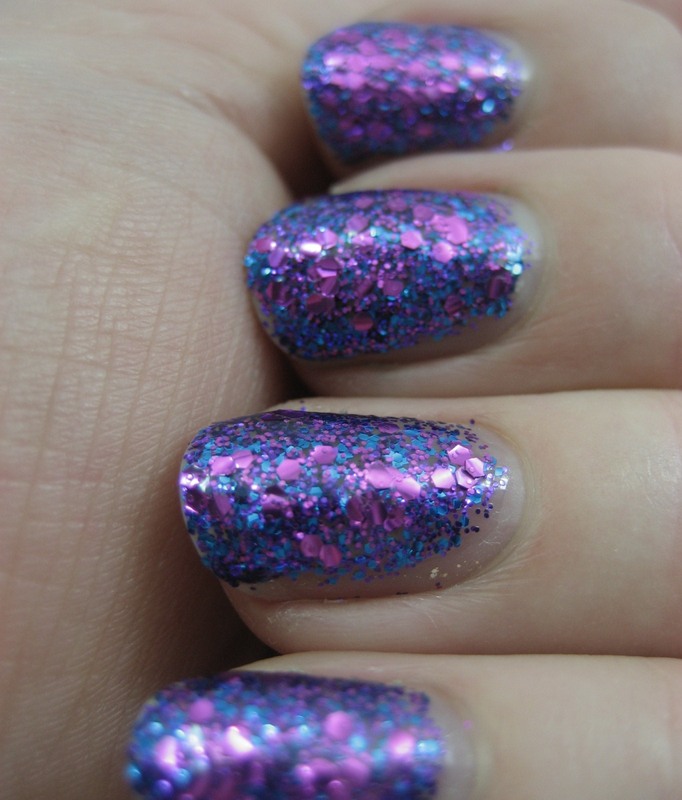 I added one coat of Fuchsia on top to make it a real party on my nails. This has small and large hexes, all the same color; its large ones are a lot bigger than the ones in Twinkle. None of these swatches have top coat, so they're a bit bumpy; not as bumpy as I'd expect from such chunky glitters, though. The next time I use these, I'll probably layer them over a complementary shimmer or foil.